I’ve been looking for a retailer that carries mid-price, fairly aggressive fashion for women over 50. 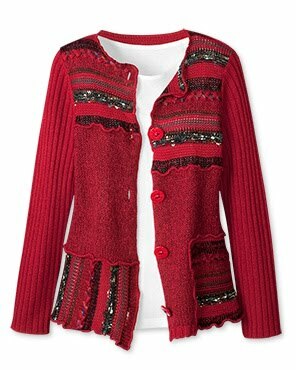 Instead, I find a lot of dorky tailored and embroidered denim, relentlessly cheerful prints and patterns in ugly barn red (like this ghastly acryllic sweater from Clearwater Creek), and shiny, flimsy stretchy knits (Chico’s Travelers line). Most of it matches and coordinates, making it the kiss of death now that everyone under 40 is wearing “nothing matches” outfits. My solution is to buy plain, natural fiber stuff from Eddie Bauer and Gap (they offer petite sizes and a variety of pant lengths) and mix it in with designer and vintage pieces I pick up at consignment shops and Seattle-area artisan seamstresses. I also look at Sundance catalog for ideas, though their clothes are not designed for short women. I used to buy a lot from J. Jill. They’re known for incorporating up-to-the minute details (gathers, trims, buttons, raw seams, etc.) into classic styles, and they keep the pieces professional (no plunging V-necks, sheer fabrics, etc.). J. Jill is also known for using 50+ models with gray hair — a few years back, their iconic lead model was Cindy Joseph, profiled here in the new Experience Life magazine. Unfortunately for me, for the past few seasons J. Jill has been making much of their clothing in cream, beige, and pastels — a palette that just doesn’t work for my hair color and skin tone. So I was thrilled to find Ari Seth Cohen’s blog Advanced Style. It’s filled with photos of women and men from their 50s into their 90s wearing high fashion. Some of the women are sporting very colorful, eclectic vintage clothes; others are wearing more of the European natural-fiber look that I admire. You’ll see colorful knits, fabulous boots, sharp vests, and all sort of inspiring fashion items. >I’d been toying with the idea of a fashion post yesterday, but after getting a tip about this sale in Bellevue Saturday, I knew I had to write. The topic is boutique fashion. There are classic clothes (Eddie Bauer, J. Jill, Nordstrom, Sundance, Isabella Bird) and there are…clothes. I first got the bug for boutique clothing at a Naked Ladies party—a clothing exchange hosted by women in the area dance community. One of the items someone brought to the exchange was a tan corduroy skirt. Sounds plain, but it had details: Hollywood waist, a hidden zipper with a very slim pull, and asymmetrical ruching that brought the skirt up to knee level at one part of the front. This sounds weird; it looked great. Boutique clothing is characterized by lush and extreme materials; lots of detailing; lots of drape; and (often) exotic colors. There’s nothing cookie cutter about it. If you like the bright turquoise crocheted sweater but want it in red, you’re out of luck. It’s often discouraging to try to mix a piece of boutique clothing into a regular wardrobe because it speaks a whole other language. Or at least talks with a very strong accent. So…I ventured into Anthropologie at University Village Thursday and found an amazing dress. However, I ran up against another of the weird phenomena of the boutique clothing world: skimpy sizing. I wear an 8 or a 10, but the manufacturer of the dress only made the item up to a size 8 (which they label a large!). And I thought I really needed a 10. The led me to search online, where a store called Tobi carries the brand (Velvet) and has similar styles of dresses that do come in a 10. And this morning, when I came across the info on the Eastside Upside-Down Sale, I noticed that one of the brands at the sale will be Velvet. One of the boutiques at the sale will be the intriguing Tatters from Mercer Island. I got a quick look in their window a few weeks ago, and am definitely interested. Bringing it all full circle: One of the skirts shown on Tatters’ homepage is remarkably similar to the tan corduroy skirt that got me interested in this type of clothing in the first place.